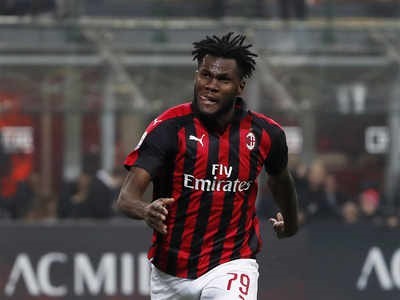 MILAN — Inter have been handed a suspended stand closure on Monday for racist abuse by their fans towards AC Milan’s Ivorian midfielder Franck Kessie during last weekend’s city derby. The Italian football federation’s sports judge said three officials in different parts of the stadium twice heard the "racist chants" directed at Kessie after seven and 39 minutes from Inter’s Curva Nord (north stand) at the San Siro. The FIGC said the punishment was suspended for a year "with the warning that if during this period a similar violation will be committed, the suspension will be revoked and the sanction will be added to that imposed for the new violation". Inter were forced to play two games behind closed doors earlier this year after Napoli defender Kalidou Koulibaly was targeted by monkey noises and racist chants during a Serie A match on December 26. Inter coach Luciano Spalletti also received a warning after he was sent to the stands for dissent during his side’s 3-2 win which moved them to third in Serie A at the expense of Milan who dropped to fourth. AC Milan, meanwhile, were fined 10,000 euros (US$11,354) after a potentially-dangerous blunt object was thrown onto the pitch. Torino’s Nigerian wing-back Ola Aina was slapped with a three-game ban and fined 10,000 euros, for his "intimidating attitude towards the referee" during his side’s 3-2 defeat by Bologna. The on-loan Chelsea player was sent off in added time by referee Maurizio Mariani after picking up his second booking. "Sorry for the defeat and for the red card, we learn and move on," Aina posted on Instagram.